P/O Colin George Nairne, RNZAF NZ42117 – Pilot. Lost without trace age 22 on the 30th of July 1944. Killed age 21 on the 26th of August 1944. Grave location – 5. H. 13. Sgt. John Ross Nation, RNZAF NZ40945 – Observer. Lost without trace age 22 on the 3rd of July 1941. Son of Esdaile Chilcott Nation and Mavis Nation, of Waipawa, Hawke’S Bay, New Zealand. Sgt. 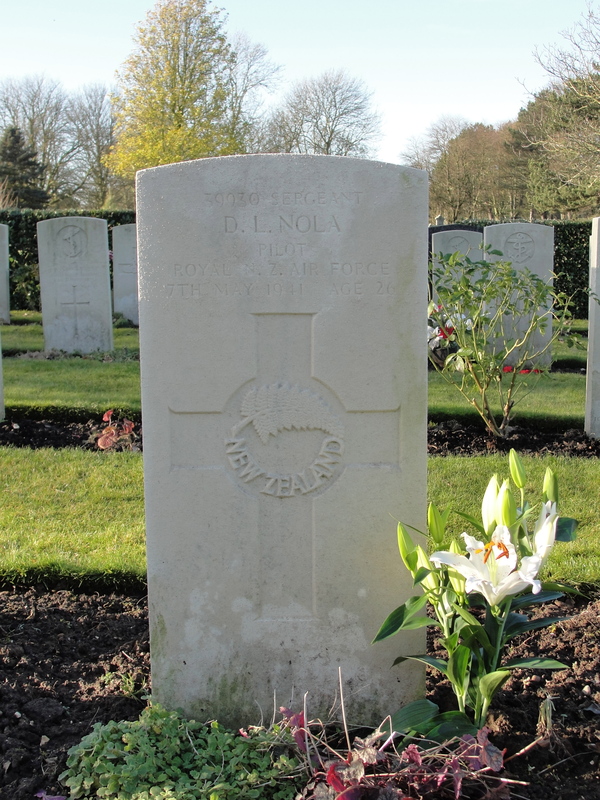 William Eric Nevill, RAF 631165 – Wireless Operator. Killed age 23 on the 26th of July 1940. Son of William Thomas Nevill, and of Violet Gertrude Nevill, of Edmonton, Middlesex. Grave location – Plot 69. Row A. Grave 15. Sgt. 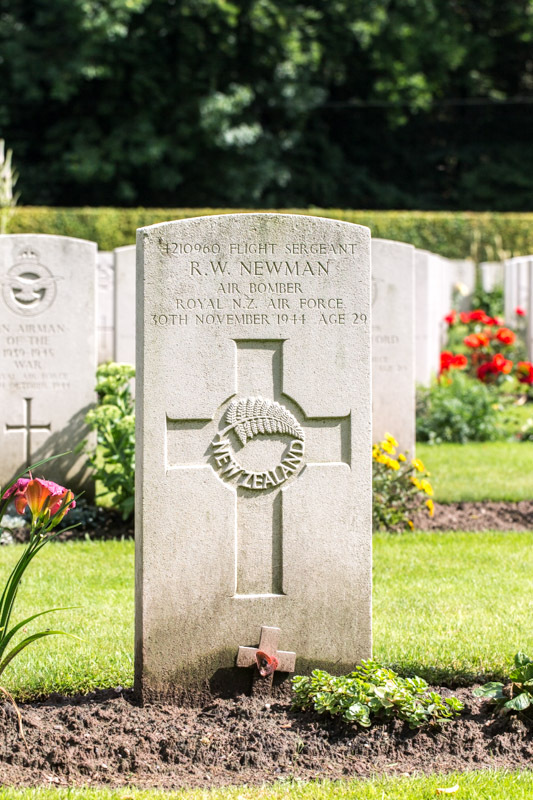 Richard Alfred William Newman, RNZAF NZ405309 – Wireless Operator. Killed age 24 on the 4th of September 1942. Son of Alfred and Ada Newman, of Wellington City, New Zealand. Grave location – 3. A. 1. F/S Ronald Wynne Newman, RNZAF NZ4210960 – Air Bomber. Killed age 29 on the 30th of November 1944. Son of Ludvic M. and Elsie Newman; Husband of Kate I. Newman, of Gisborne, Auckland, New Zealand. Grave location – 25. A. 7. Eighteen aircraft took off as detailed carrying 4,000 lb, 1,000 lb, 500 lb, and Incendiary bombs to attack the coking plant at Osterfeld. Seventeen aircraft attacked the target successfully through ten tenths cloud with tops 10,000 feet, and the raid was reported as being well concentrated. One aircraft captained by NZ411915 F/O J.A. McIntosh is missing and the aircraft is believed to have had its tail shot away. F/O James Alexander McIntosh, RNZAF NZ411915 – Pilot. F/S Robert Carhampton Morgan, RNZAF NZ421389 – Navigator. F/S Robert James Boag, RAAF AUS.432097 – Wireless Operator . F/S Richard Thomas Taylor, RAFVR 1401963 – Flight Engineer. Sgt. Cyril Brewer, RAFVR 1418695 – Mid Upper Gunner. Sgt. Edward Roy Cooper, RAFVR 2221308 – Rear Gunner. Lancaster Mk.I NF980 JN-F received a direct hit by flak over the target and it appeared to another crew flying close by, to have lost most of its tail-plane. The aircraft fell sharply out of the sky and struck the ground violently. The rear gunner was the only survivor but he too, died from his injuries in a hospital about 3 weeks later. Sgt. Alfred Newnham, RAFVR 1172993 – Rear Gunner. Lost without trace age 24 on the 14th of March 1944. Son of John Lionel and Mary Newnham, of Sittingbourne, Kent. Grave location – Panel 235. No official account of the loss of the crew exists, or is officially accepted and as such the Rowberry crew are recorded as lost without trace. 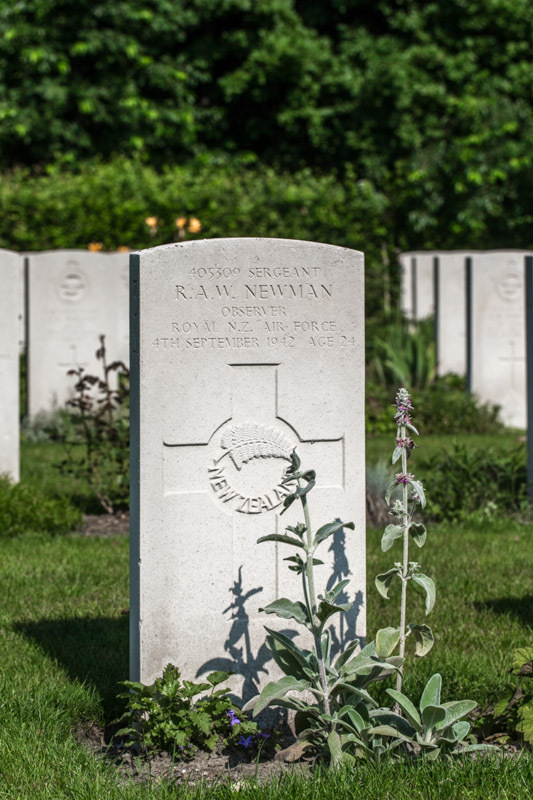 The loss of an entire crew is a tragic occurrence, perhaps made more poignant by the loss the crew’s Rear Gunner, Alf Newnham. Two days after returning from a special Operations Op with W/C Roy Max as Pilot, Alf (normally flying as part of Edgar Burkes crew), was sitting on his bed when Alfie Venn, Rear Gunner with Jim Climie’s crew came in and informed him the Rowberry crew were down and a Rear Gunner. W/C Raymond John Newton, DFC, MiD, RNZAF NZ40984 – Pilot. Lost without trace age 28 on the 1st of January 1945. Son of John King Newton and Maud Elizabeth Newton, of Christchurch, New Zealand. Grave location – Panel 284. Sgt. John Nichol, RAFVR 1670779 – Rear Gunner. Killed age 28 on the 14th of March 1945. Son of John Albert and Louie Nichol, of Gosforth, Newcastle-On-Tyne. Grave location – 25. D. 5. Lost without trace age 26 on the 21st of March 1945. Son of Harry Hope Nicholl, and of Beatrice Ellen Nicholl, of Pomphlett, Devon. Grave location – Panel 276. Killed age 20 on the 16th of May 1942. Grave location – Joint grave 3. B. 11. Son of Herbert Leggatt Nicholson and Alice Nicholson, of North Cheam, Surrey. 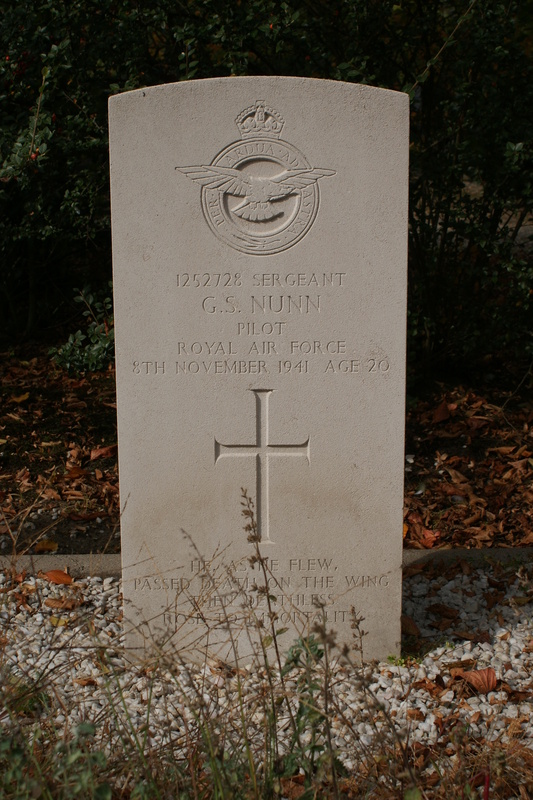 W/O Henry Nicol, RAF 657425 – Pilot. Lost without trace age 23 on the 25th of July 1943. Son of Henry and Margaret Nicol. Grave location – Panel 134. P/O Trafford McRae Nicol, RNZAF NZ411929 – 2nd Pilot. Fatally wounded, dying of his injuries the following morning age 21 on the 23rd of April 1942. Son of James Alexander and Louisa Clara Nicol, of Seatoun, Wellington, New Zealand. Grave location – Row C. Grave 11. P/O Eric George Delancey ‘Rick/ Riki’ Jarman , RAAF AUS.404507 – Pilot. P/O Trafford McRae Nicol RNZAF NZ411929 2nd Pilot. Sgt. William Henderson Taylor, RAFVR 1051621/ 122053 – Navigator. Sgt. John Alexander Fernie, RAFVR 980003/ 127783 – Wireless Operator. Sgt. R.S. Davey, RAFVR – Front Gunner. Sgt. Richard James Harris, RNZAF NZ402999 – Rear Gunner. On these five operations only one aircraft was lost, but several injured men were brought back. 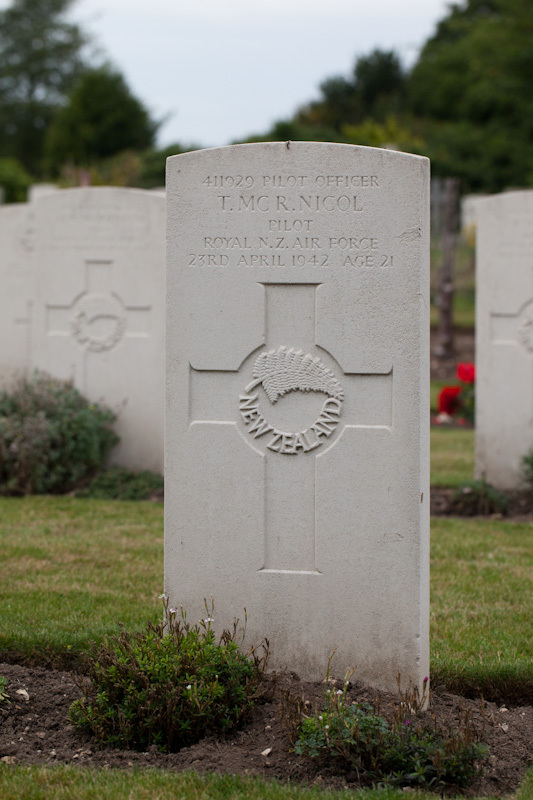 One, Pilot Officer T. McRae Nicol, of Welling­ton, had been badly hit in the abdomen by shell-splinters. He was in great pain when they lifted him tenderly from the aircraft into the ambulance, but he had a smile for Olson. ” I’ve got a guts full of lead, sir,” he told the CO., almost proudly. Morphia eased the rack of the pain, but although he probably knew he had little chance of survival, he remained cheerful until he died. Trafford’s niece, Barbara remembers reading a letter from the Squadron’s Chaplin to Trafford’s parents saying that Trafford was a great leader, was always so positive and one of his favourites. The letter also said that a WAAF had given Trafford a cup of hot tea before he was removed from his Wellington, and that the hot tea may have caused more damage to his stomach. Barbara says she always thought that it was funny how her uncle died in the war from a hot cup of tea……. Trafford was buried with full military honours at Feltwell’s St. Nicholas Churchyard, Row C Grave 11, on the 29th of April. His crewmate Jim Harris was buried the same day at St. Nicholas Churchyard, Row B Grave 11. Killed age 26 on the 7th of May 1941. Son of Ivan John Nola, and of Kate Nola (Nee Versalko), of Tatuanui, Auckland, New Zealand. Buried Grimsby (Scartho Road) Cemetery, Lincolnshire, England.. Grave location – Sec. 116. Row J. Grave 5. 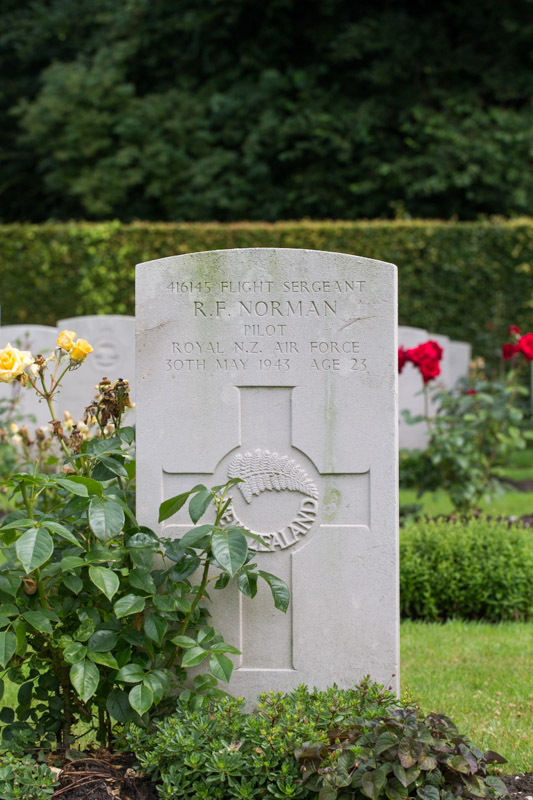 F/S Raymond Fraser Norman, RNZAF NZ416145 – 2nd Pilot. Killed age 23 on the 30th of May 1943. Son of William Matthew and Annie Norman, of Winton, Southland, New Zealand. Sgt. Harold Sidney Norrington, RAF 646162 – Mid Upper Gunner. Killed age 23 on the 25th of July 1943. 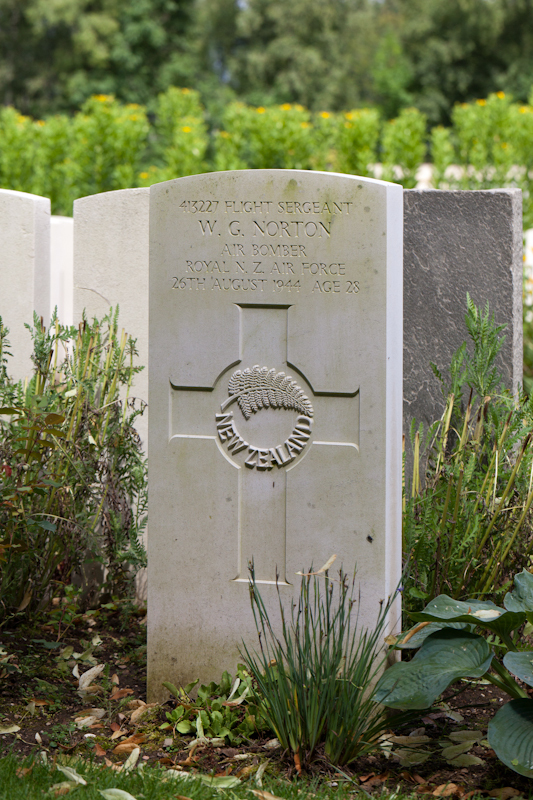 Son of George Edward Norrington, and of Edith Grace Norrington, of Bexleyheath, Kent. Grave location – 4A. B. 6. Son Of George Allan Norton, And Of Louisa Jane Norton (Nee Webb), Of Christchurch, Canterbury, New Zealand. Son of Sidney Carter Nunn and Lily Evelyn Nunn, of Sawston, Cambridgeshire. Grave location – Row 1. Grave 4.